Seahorses are amazing! They are really fascinating, distinctive creatures. They are very strange but are really a fish. You can turn them 90 degrees and match up their body parts to that of a fish and it’s much easier to see. They have gills, fins and a swim bladder, like fish. They have a bent, flexible neck and a prehensile tail instead of a tail fin. Their scales have morphed into bony plates and they swim vertically instead of horizontally. Whilst they are a diverse species, they all have the same basic body plan. Where they differ is in colour, size – they range in size from 1.5cm to 35cm – and habitat – they are found all around the world, generally in warmer, shallower waters. That said, they have been found in the Thames Estuary! They are masters of camouflage and blend into their surroundings so well that you could easily overlook them. Seahorses eat crustaceans mostly, but occasionally baby seahorses… They are eaten by fish, octopuses, crabs and birds. Another major threat is the traditional medicine industry where they are used to improve general health and wellbeing. Apparently the seahorse is the celtic zodiac animal for those born between 19th February and 27th March, which includes me! 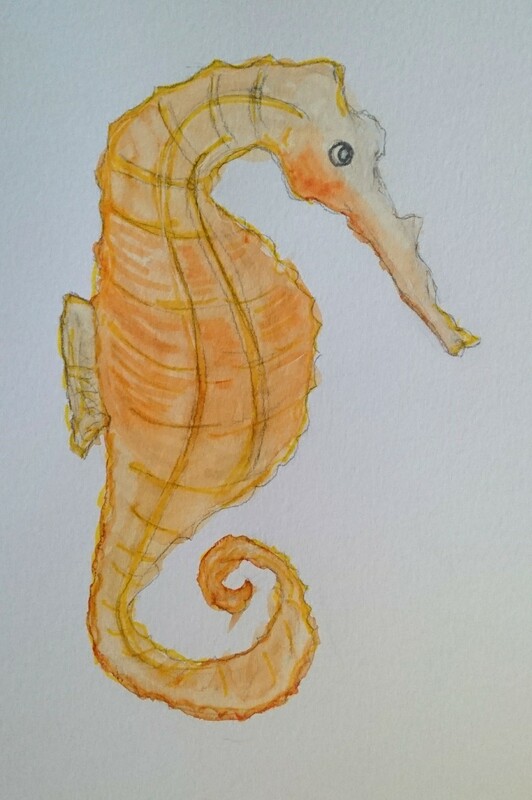 But the reason I love the seahorse is that they defy convention. They use their tail to hold on to stationary objects so that they don’t float away. This is really important as they are actually really poor swimmers… You could say that they are poorly matched to their environment but they’ve just found an alternative way to survive and thrive. A reminder to us to think outside the box. And when it comes to alternative lifestyles, the seahorse is leading the way. Male seahorses have a very involved role in child rearing and the female has very little to do with it. Things kick off with a courtship display and a sensual synchronised swimming experience where the two seahorses let go of whatever they are holding onto and drift towards the surface together. This is thought to bond them and during this process the male shows off his big, empty pouch. Once they are ready, the female then squirts her eggs into his pouch and then swims away, leaving the male to do the rest. He then fertilises the eggs with his sperm and then incubates them for 9 to 45 days depending on the species. As the babies grow, he gets bigger and more sedentary until finally they are ready to be released. I saw a video of this and the little male seahorse looked like he was in pain. The babies, fully formed just very small, are expelled from him through a series of muscular contractions. There can be over 2000 babies which are born independent. Just before birth, the female reappears to claim her male and almost as soon as the babies have been born, the ritual starts all over again. A male can have several clutches in one breeding season and is very much on a treadmill of childbirth. Whilst there are rumours which suggest that seahorses are monogamous, this is not true. However, unlike some non-monogamous species, all the babies in the pouch belong to the same mother and about half of seahorses mate with the same partner the next season. This is likely because then they don’t have to move around too much to try and find a new mate which would increase their chance of being eaten. These fascinating animals defy convention and encourage us to do the same. Often we do things because that’s the way they are done, blind to the idea there might be another way.